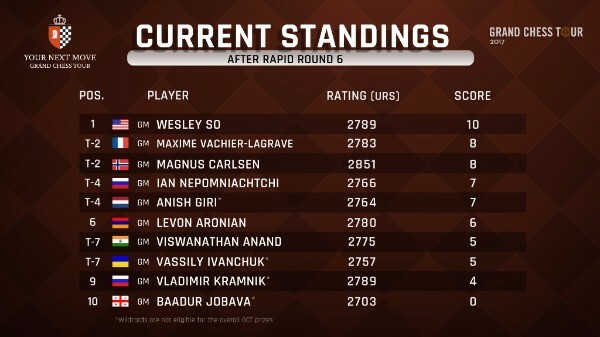 After day two of the rapid, Wesley So increased his lead by a point. He is being closely chased by Magnus Carlsen and Maxime Vachier-Lagrave who are one move away from catching the leader. It is interesting to note that all three players recently completed the Paris leg of the Grand Chess Tour so it will be interesting to see if fatigue will play a role in their performance. Tomorrow is the final day of the rapid part of the tournament which will determine who will be in the lead going into the blitz portion. Wesley So started the day off right by delivering yet another loss to Baadur Jobava. The Georgian, who lost all his games yesterday, must be getting impatient wanting to score any points. He had the perfect opportunity to do so in this game, as he could have made a draw but instead lost the thread of the position and lost. Just as in his game against Jobava yesterday, Levon Aronian met his opponent’s fork with a bishop sacrifice. This time his victim was Viswanathan Anand, who found himself in a mating net in the endgame. Anish Giri’s birthday celebration continued as he received a nice gift from Ivanchuk who went astray with his queen and resigned a move later. As Giri himself described, sometimes ambitious players start inventing things that the position simply doesn’t offer. Vladimir Kramnik won a pawn against his country man, but Ian Nepomniachtchi played actively and found enough counter play to draw the game. 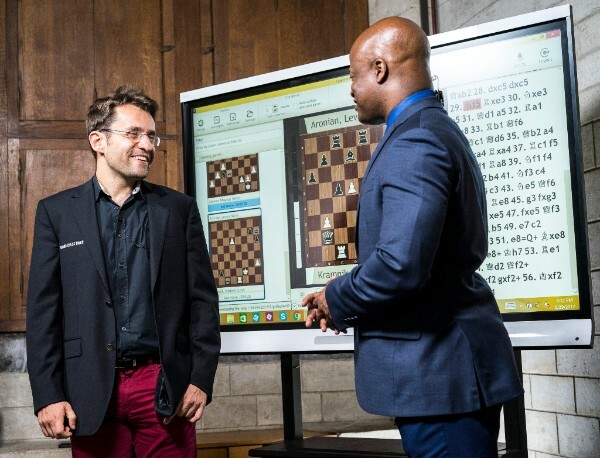 Magnus Carlsen and Maxime Vachier-Lagrave met once against since their playoff in Paris, but the game ended in a draw after the Frenchman failed to utilize his opening advantage. Magnus Carlsen played a very instructive strategic game against former World Champion Vladimir Kramnik by first outplaying him in the middle game, then trading into a winning endgame. Carlsen was quite pleased about the quality of his game and was feeling optimistic about the rest of the event. Viswanathan Anand bounced back from his loss in his true fashion by finishing off Vassily Ivanchuk in a mating attack. Ian Nepomniachtchi continued his impressive performance by defeating Levon Aronian who failed to find defensive resources with little time on his clock. Baadur Jobava wasn’t able to improve his score as his slightly worse position kept getting worse and worse until it became indefensible. His opponent, Maxime Vachier-Lagrave, isn’t satisfied with his form in this event but he is compensating for it with improved concentration. 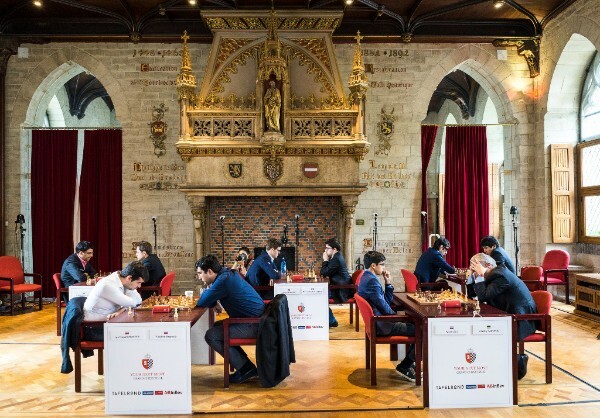 Anish Giri and Wesley So drew after the Dutchman decided not to test the waters and allowed a perpetual. 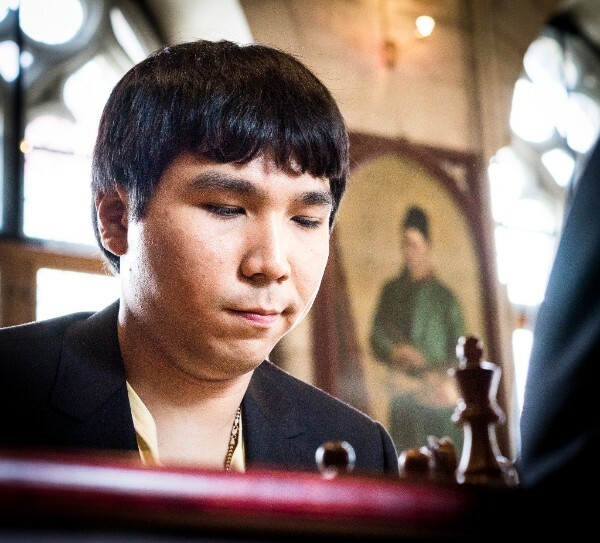 Wesley So maintained his position in the standings by converting his extra pawn in a rook endgame against Viswanathan Anand. The World Champion won an easy game against Baadur Jobava who keeps suffering in this event whereas Vachier-Lagrave drew Anish Giri. Both Carlsen and Vachier-Lagrave are inching closer to Wesley So’s first place position. Fan favorite Levon Aronian found a brilliant tactic with seconds left on his clock, leading to a beautiful position where he was down a pawn but one of his pawns would queen. Ian Nepomniachtchi stumbled and fell behind the leaders after he played a little too ambitiously against Rapid World Champion Vassily Ivanchuk and ended up losing the match. 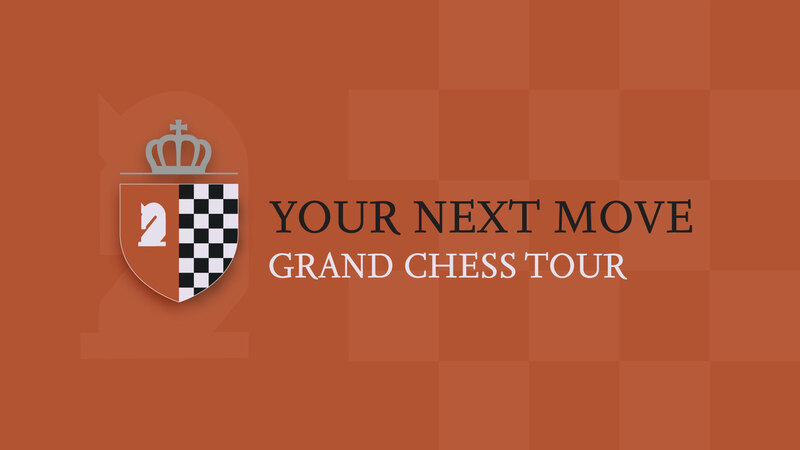 All information is available on GrandChessTour.org. 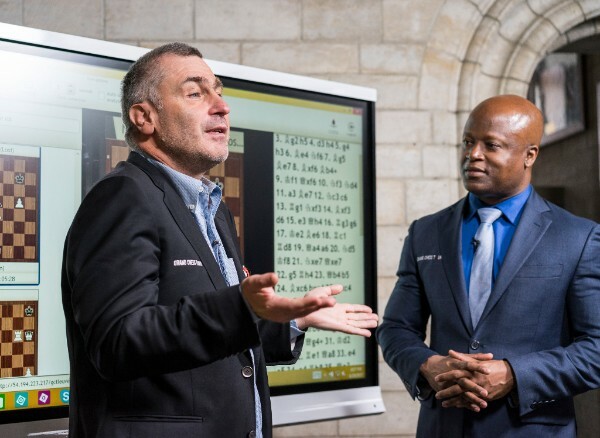 Live commentary by GM Yasser Seirawan, GM Cristian Chirila, and IM Jovanka Houska will give online spectators even more opportunity to experience the tournaments. As last year, GM Maurice Ashley will be on-site in Paris to interview players and will be joined by GM Nigel Short. Watch live.